It is no secret that shareholder activism has gained traction over the last decade; and lobbyists are seeking to undermine its pursuit of data disclosures they would rather keep under wraps. As shareholder activists push to improve transparency in corporate America, corporate lobbyists--especially those representing the interests of the Oil & Gas industry--are fighting to keep data behind closed doors by attacking the bedrock of shareholder activism: the shareholder resolution. A shareholder resolution is a non-binding recommendation to the board of directors of a public corporation regulated by the U.S. Securities and Exchange Commission. Proposed by shareholders, resolutions are presented and voted upon at the corporation's annual meeting and through the annual proxy vote. A shareholder must own at least $2,000 or 1 percent of the company’s shares and have held the shares continuously for the year prior to the company’s annual submission deadline. The resolution has to be about something that is relevant to the company and upon which the company can take action. After the company receives the shareholder's proposal, if the resolution does not meet all of the SEC's criteria, the corporation can choose to omit, that is not to include, the resolution in the proxy statement. Shareholder activism is a process that often takes time. Boston-based Walden Asset Management urged filtration company Clarcor to issue sustainability reports for over 3 years until Clarcor conformed. In 2013 (when Walden first filed), 72% of the companies in the S&P 500 reported emissions data to CDP, a global non-profit working with companies to reduce their environmental impact, and Clarcor was clearly lagging behind industry peers. This statistic, along with Walden's explanation of the material risks associated with poor environmental practices, led 54.5% of shareholders to support sustainability reporting. Further, nearly a decade and a half after oil giant ExxonMobil was asked to adopt a non-discrimination policy towards LGBT employees, management finally acquiesced. The company had received a shareholder resolution every year since 2001 asking for sexual orientation and gender identity to be added to its list of protected classes. These resolutions helped raise awareness for the issue and compelled others to get involved; President Obama signed an executive order in July of 2014 mandating federal contractors such as ExxonMobil to include LGBT workers in their non- discrimination policies. That same month, ExxonMobil announced they would comply with the order. After Wells Fargo became embroiled in a scandal which involved the unauthorized opening of over 2 million customer accounts, investors such as the California and Illinois State Treasurers pointed to the combined CEO/Chairman role as a factor that enabled the scandal. Activist investors filed a shareholder resolution demanding an independent chairman to lead the board. Wells Fargo bowed to the pressure and agreed to amend its bylaws, separating the role of CEO and Chairman and ensuring the placement of an independent Chairman. Such a move presents greater oversight and transparency for the company’s operations and the ability to minimize risk. Since 2010, 130 shareholder resolutions have been filed asking companies to set science-based climate change goals and, until recently, only those with technical errors (ex. Filing late) were excluded from appearing on the proxy ballot. This spring, however, in a shareholder resolution mirroring greenhouse gas reduction targets of the Paris Climate Agreement, the Oil and Gas company EOG Resources successfully threw out a shareholder resolution filed by Trillium Asset Management. The SEC supported EOG Resources wish to block the shareholder resolution. Trillium Asset Management had successfully filed for nearly identical science-based, GHG emission targets to be included and voted on Proxy Ballots at Chevron, Exxon Mobil, Valero, ConocoPhillips, WPX Energy, and Marathon Oil Corporation. The dismissal of Trillium's Shareholder Resolution by the SEC is a dangerous precedent for investors seeking to change laggard behavior in their portfolios. And frankly, the dismissal makes little sense. The SEC's decision mirrors the wishes of the Main Street Investors Coalition. The coalition is tied directly to the National Manufacturers Association and interests of the fossil fueled industry. In fact, the Executive Director, George "David" Banks, is a well-known fossil fuel lobbyist and has served both the Bush and Trump administrations. According to The Hill, Banks "had a leading role in the [Trump] administration's policies regarding the Paris climate agreement." The fact that major fossil fuel lobbying money is being diverted to impede a non-binding process that calls for the release of data demonstrates just how damaging poor environmental stewardship is to a public company in 2018. In a market where quarterly earnings reports dictate boardroom decisions, we believe shareholder activism is a necessary function to engender sustainable business practices that serve longterm value for shareholders. The attack on shareholder engagement is ongoing and we will be posting updates to this blog, our twitter account and LinkedIn. In the meantime, when you receive an annual proxy ballot in the mail, think twice about throwing it in the recycling bin before making your voice heard - you can vote by mail, phone or online. Gethard, Gregory. “Protest Divestment And The End Of Apartheid.” Investopedia, Investopedia, 16 July 2008, www.investopedia.com/articles/economics/08/protest-divestment-south-africa.asp. “Naylor Association Management Software.” The Forum for Sustainable and Responsible Investment, Naylor Association Management Software, www.ussif.org/resolutions. “Clarcor Investors Back Sustainability Reporting Call.” Nashville Post, www.nashvillepost.com/business/management/corporate-governance/article/20493095/clarcor-investors-back-sustainability-reporting-call. Cohn, Yafit, and Simpson Thacher & Bartlett LLP. “Climate Change, Sustainability and Other Environmental Proposals.” The Harvard Law School Forum on Corporate Governance and Financial Regulation Firm Age Corporate Governance and Capital Structure Comments, corpgov.law.harvard.edu/2016/09/06/climate-change-sustainability-and-other-environmental-proposals/. Armental, Maria. “Wells Fargo Formally Separates Chairman, CEO Roles.” The Wall Street Journal, Dow Jones & Company, 2 Dec. 2016, www.wsj.com/articles/wells-fargo-formally-separates-chairman-ceo-roles-1480624729. 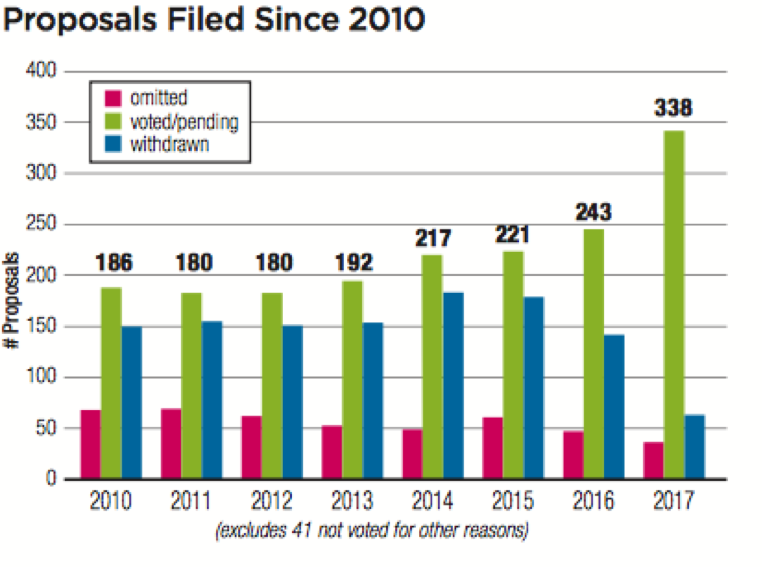 “2017 Proxy Season Review.” Proxy Preview, As You Sow, www.proxypreview.org/proxy-preview-2018/2017-proxy-season-review/. Cama, Timothy. “Former Trump Adviser Heads Effort to Crack down on Climate Shareholder Resolutions.” TheHill, The Hill, 22 May 2018, thehill.com/policy/energy-environment/388763-former-trump-adviser-heads-effort-to-crack-down-on-climate. Older PostIs Current Employee Compensation Sustainable?